So glad you had a good trip to Yellowstone NP. My daughter and I were there end of July 2009. 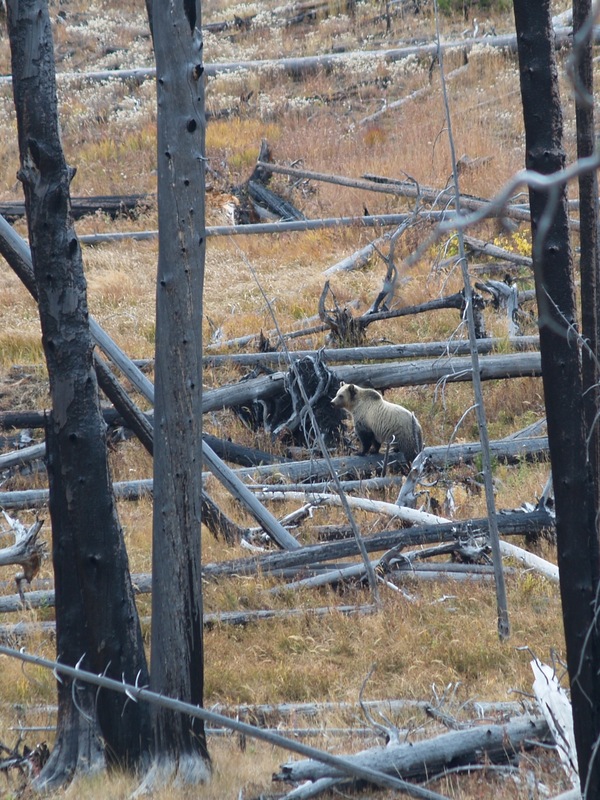 We also encountered a grizzly bear. In the parking lot near our log cabin. Park Rangers were called in to guide him/her back home. Loved walking round Old Faithful Inn and thinking about all the cowboys who had walked there years ago. And you can’t forget Old Faithful who was on time. A wonderful vacation. What a bonus! All we got to see at Yellowstone were instructions on how to stay safe in bear country… and Smokey posters. 🙂 Thanks for the GrizzPuzz! Your photos are amazing! Thanks! Wow. On your property or in Yellowstone? Thank goodness, it was in Yellowstone! What a great picture you are talented!